It’s been two years since Texas Ranger Jameson Beckett has seen Jelly Stockwell. Now she’s crashed back into his life with a toddler and no memory of their once-intense relationship. Ella Butler wasn’t expecting rescue in the form of Holden Crawford, a perfect stranger. But will his protection be enough to save her from ruthless killers, let alone absolve him of his own dark past? His time with the marines left him speechless with nightmares, but when pregnant Kasey Doka escapes a surrogacy ring and seeks out his help, Cold Redhorse feels something between them that goes deeper than words. 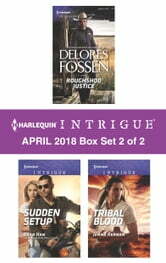 Look for Harlequin Intrigue’s April 2018 Box Set 1 of 2, filled with even more edge-of-your seat romantic suspense!